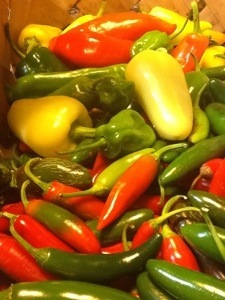 Chillies: the real spice of life! 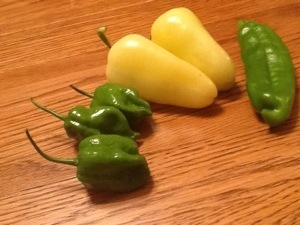 We love hungarian hot wax peppers (shown below). They are sweet up front with a big, clean, late-breaking heat. 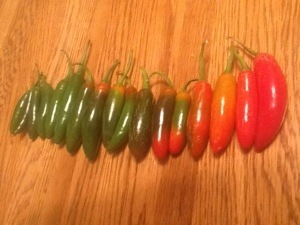 I couldn’t wait for all the peppers to get ripe to do this post, so here are the under-ripe representations of Habanero, Fresno, and Anaheim. Habanero is one of the hotter peppers that are popularly available. Fresnos are sweet, and have a very mild heat. Anaheims are also fairly mild, but they are good for drying, as they have thinner walls than the Fresno. The Habaneros will turn a bright orange. The others will end up red. We are young: So lets set your tongue on fire! Pasilla Bahijo is fun to say, fun to look at, and kinda hard to figure out what to do with…. That is until you learn to make ristras. Then, it’s a great pepper to hang dry, decorate with, and save for some January day when you are snowed in and have all the ingredients in your root cellar to make an awesome mole sauce: canned tomatoes, Pasilla peppers, pumpkin seeds, 8000 different spices, time, and boredom with wintertime food. 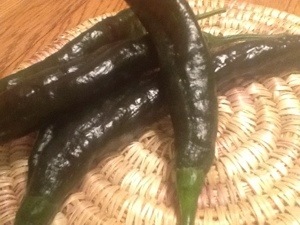 Pasilla peppers can be smoked. They have a rich, medium-hot, and sweet flavor. Everyone knows Poblanos. We don’t grow many, but we like ’em. Dried, they are called Anchos. They can have some heat to them. They are oftentimes stuffed and roasted. 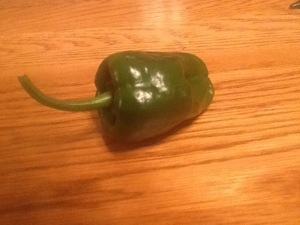 We love Serrano peppers, Jalapeno’s spicier cousin. They have a citrusy, crisp flavor with a nice heat-backing. 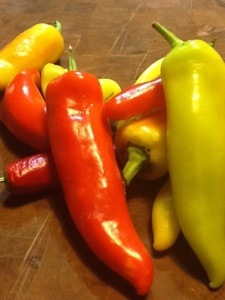 They ripen red like Jalapenos, but, like Jalapenos, you can’t often find them that way. They are usually sweeter once ripe. They can be frozen once chopped if your crazy CSA farmer has given you way too many, and they’re piling up in the fridge. Consider a rubber glove to be useful here. I see what’s going on here! 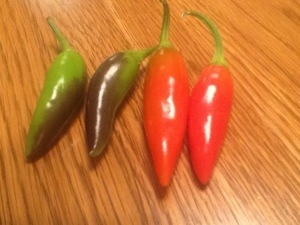 Thai Chillies are really hot. There are many types. This is one of them. Well, that’s what we’ve got.